It feels sad when our pets get sick or injured. The innocent creatures cannot even express the pain they go through. In such cases, it becomes a must to visit a pet clinic and get the best treatment for the pet. However, prior to taking the pet to any veterinarians, it is suggested to be sure about the diagnostic procedure, the suffering and the cause of suffering in detail. 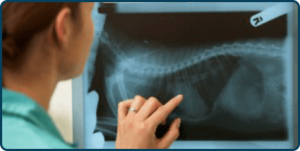 We, at Westheights Veterinary Hospital Kitchener, provide digital X-Ray to properly diagnose various conditions such as internal injuries, fractures, infections, and many others. From veterinary digital radiography machine, we can send radiographs to radiologist to seek their opinion if warranted. Digital radiography is equipped with electronic sensors that produce clear image of internal organs. This image can be viewed and stored in the computer for future reference. Digital radiography requires less radiation to create an image. Digital radiography is an ideal technique to monitor the healing process within the body.After an orthopedic repair, we suggest digital radiography to check the status of the broken bone. This technique is most often used while dental check up, for an exhaustive evaluation. X-rays help our vets to identify and address the pet health issues at their initial stage. Digital X-rays enable our veterinarians to see and diagnose the issues developing inside your pet’s body. This non-surgical and painless diagnostic help us to develop an effective treatment plan to eliminate the factors causing pain and discomfort for your pet. At Westheights Animal Hospital in Kitchener, we aim to detect the critical internal health problems of your pet before they get worse. Our vets use advanced medical tools and veterinary medicines to ensure optimal health of your pets. Contact us now to know more about digital radiology services.